Drawn from live specimen observed in the Superstition Mts., Pinal Co., AZ. 29 Feb 1992. RANGE: Where the Upland Sonoran Desert of Arizona meets the Interior Chaparral. Mostly above 1200 m elevation. 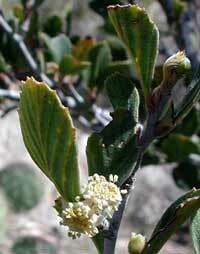 Mountain mahogany can also be found at higher altitudes in pinyon-juniper and even marginal ponderosa pine habitats. 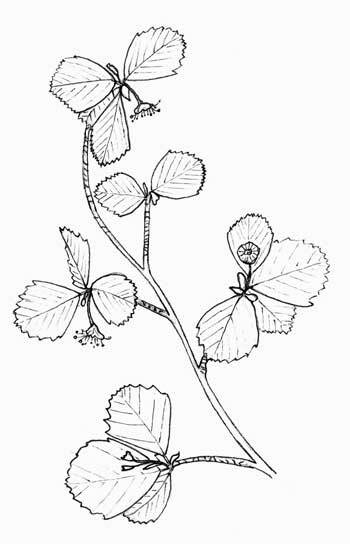 LEAVES: Tough, leathery leaves are orbicular or wedge-shaped with the margin of the distal half finely toothed. Underside veins prominent. FRUIT: An elongated nut-like achene is tipped with a conspicuous feathery plume several centimeters in length. Each flower has one pistil. Observed in the southern foothills of the Bradshaw Mountains, Yavapai Co., Arizona. 24 May 2009. SHRUB: A medium to large shrub in Arizona. The shrubs can regrow after a fire because the underground root-crowns generally survive. 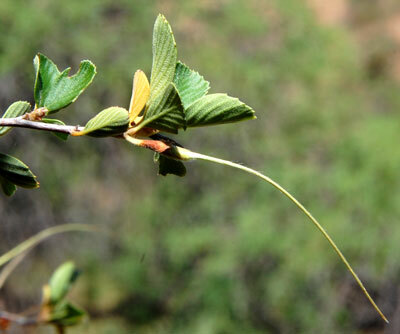 Thus the presence of mountain mahogany may perpetuate a fire cycle typical of chaparral habitat. FLOWERS: Yellowish-cream flowers are quite fragrant appear early spring. There are no petals but the rim of the tubular hypanthium is flared and flower-like. One to three dozen stamens. UNARMED: The twigs are stiff but lack thorns.